Most people visiting San Diego tend to stay in the actual city of San Diego and neglect its suburbs. While suburbs normally aren’t something terribly exciting on a vacation, San Diego County is home to some pretty impressive ones thanks to that gorgeous Pacific coastline, and many of these suburbs can be found in the area referred to as North County that is situated north of the San Diego city border. Visitors with kids may get a taste of North County when they make a jaunt up to Carlsbad to visit Legoland, but there is much more to see in North County San Diego than those famous building blocks. Here’s why you don’t want to miss out on this area of San Diego County on your next visit to America’s Finest City. First, where exactly is North County San Diego? North County stretches coastally from the tiny and tony city of Del Mar up to the more massive Oceanside, catching the beloved beach towns of Solana Beach, Cardiff, Encinitas, and Carlsbad within its boundaries. North County then spreads east to residential Vista and San Marcos and the sprawling city of Escondido. There is a big difference between coastal North County and inland North County. Though it’s only about twenty miles from the coastline to downtown Escondido, everything changes from the look to the temperature. Inland North County quickly transforms from city life into rural land when you get to its borders. North Escondido has rolling hills that are largely undeveloped except for some sporadic houses plus a famous resort and must-see animal attraction (which I’ll get to later). It’s also much hotter in Escondido and most of San Marcos since you don’t get the coastal breezes. On the flipside, once you get east of the I-5 Freeway (the main north-south byway in North County) you get a lot more sunshine during the months when the marine layer is heavy over the coast. Each beach town (actually city) has its own little downtown area. Oceanside: The downtown area of Oceanside has been revamped in the past decade and now has trendy bars and restaurants, a movie theater, and enough breweries and local craft beer bars to warrant its own beer walking tours. Carlsbad: The downtown area in Carlsbad, called Carlsbad Village, has a large assortment of restaurants, wine bars, and coffee houses. It even has a couple places to head to for dancing on a Friday or Saturday night. Encinitas: Chill and laidback, yet with elements of hipster and luxury thrown in. You’ll find trendy bars mixed in with true dive bars and surfer-inspired coffee shops right next to gourmet restaurants. Cardiff: Encinitas has a surfer vibe, but it’s the little southern community of Encinitas called Cardiff that is the true surf town. Cardiff has such its own identity a lot of San Diego locals don’t even realize its actually part of Encinitas. Here you’ll find Pipes Café, Seaside Market, Patagonia and a lot of other little shops that seem focused on community and bringing the outside in. Solana Beach: You’ll find craft beer on tap at the bars lining downtown Solana Beach, which make for a nice place to stop for a break after shopping along Cedros Avenue, a design district that has an assortment of independently owned stores focusing on interior design, crafts, and jewelry. Del Mar: There’s a high-end feel to this lovely beach town that has upscale restaurants and shops plus gorgeous views of the ocean. Try not to get too jealous of the mega-mansions lining the coastline. While beaches are great, that’s not to say the inland cities don’t have their own special charm. You’ll find rural pockets of life still tucked away in Escondido and San Marcos, while Vista has a historical downtown center that is charming to walk around and is home to eclectic bars and restaurants. Escondido is also home to a bustling downtown with businesses, office buildings, and a large movie theater. San Diego County is home to over a hundred local breweries and many visitors don’t realize they extend way beyond the city limits of San Diego. In fact, the grandfather of San Diego breweries, Stone Brewing Company, has its headquarters in Escondido along with a massive beer garden complete with trees, picnic seating areas, koi ponds and more, plus an on-site farm-to-table restaurant. Stone also has a tasting room in Oceanside. Other great breweries to visit in North County are Stumblefoot, located in a warehouse shed in Carlsbad; Mother Earth Brew Company in downtown Vista that has a cool garage feel to it; and Culture Brewing Company with a hip tasting room in Solana Beach. San Diego isn’t just about the beer, though. Escondido borders Temecula, which is a large wine-growing region in California. Though Temecula is technically in Riverside County, its winemaking ways trickle down into San Diego County and you can head to the local wineries of Witchcreek Winery in downtown Carlsbad and scenic Cordiano Winery or Orfila Vineyards and Winery in Escondido for some wine tasting excursions. One of the best things for families to do in North County San Diego is to head all the way to its eastern edge and go to the San Diego Zoo Safari Park. Well, if I’m already going to the actual San Diego Zoo, why do I need to trek up to the San Diego Zoo Safari Park? You may be thinking. The quick answer is that they are completely different. Here’s why. The San Diego Zoo Safari Park is laid out to reflect the animal’s natural habitat and allows for multiple species to roam in herds together on the same land. You can take a train over vast fields of giraffes and lions and other animals, or get even more up close and personal by taking a safari truck by cheetahs, rhinoceroses, gorillas and more. And then, there’s the aforementioned Legoland for families. It’s fun, it’s cool – if you like Legos, you’ll like Legoland. There’s also a refreshing water park for hot days. Speaking of hot days, you can also head to the Wave Waterpark in Vista for some waterslide-filled fun. North County is much sleepier when it comes to nightlife than the Gaslamp Quarter or party towns of PB and Mission Beach down in San Diego. Still, you can find a fun night out in most cities of North County and even do some bar hopping if you’re so inclined. I recommend sticking to the northern coastal cities of Carlsbad and Encinitas for a memorable night out on the town. Carlsbad Best Bets for Nightlife: Carlsbad Village Drive and Grand Street in Carlsbad Village are home to a number of bars. The Alley has live music on weekend nights while the Boar Cross’n gets people dancing with a DJ. O’Sullivans has a fun vibe and live music as well, including traditional Irish music some nights. Carlsbad even has some good dive bars, particularly the Village Pub, which is dim and narrow and has drink specials when the train goes by. Paon and Relm are good choices for wine bars while the Compass has a lively late night atmosphere with a variety of craft beers on tap and a mule cocktail menu. Encinitas Best Bets for Nightlife: Stick to downtown along Highway 101. 1st Street Bar has a laidback ambiance and pool tables. Beachside Bar and Grill and D Street Bar and Grill have a good beer selection and delicious cuisine. The Saloon has a dive bar feel that quickly turns into a club atmosphere with dance beats once the sun goes down on weekend nights. Other Best Bets for a Fun Night Out in North County: En Fuego’s downstairs bar in Del Mar, which is mostly outdoors and has a tropical feel to it; the Kraken in Cardiff, which is a dive bar with pool tables by the beach; Cardiff Beach Bar @ Tower 13 sports bar with a surfer twist in Cardiff; Cow Shed Bar and Grill for karaoke in San Marcos; and Barrel Republic in Oceanside, where you can pour your own tastings of craft beer. 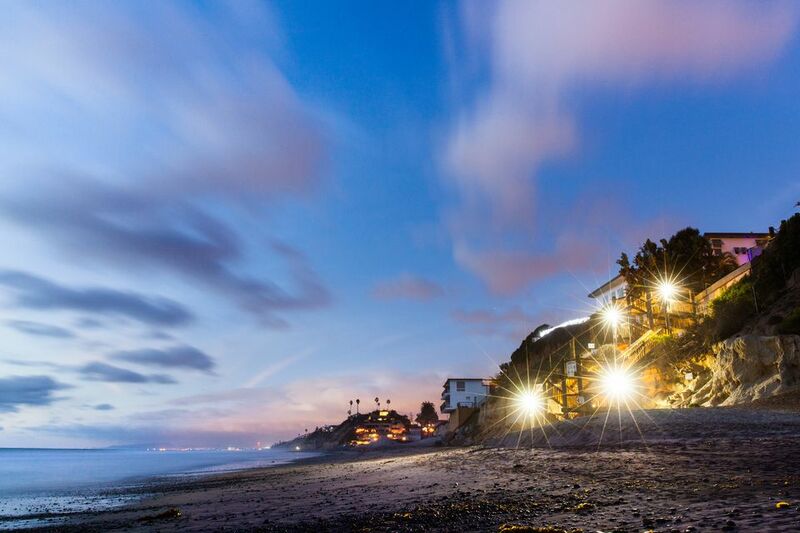 Market: Luxurious restaurant in Del Mar with a menu that changes daily. West Steak and Seafood and Bistro West: Sister restaurants in south Carlsbad specializing in local, fresh ingredients. Paon Restaurant: French-inspired restaurant with adjacent wine bar and store in Carlsbad. Sublime Ale House: Gourmet macaroni and cheese plus customizable pizza and grilled cheese in Restaurant Row in San Marcos. The Compass: Hip gastropub in Carlsbad. Yellow Deli: Incredibly delicious sandwiches and soups served in a charming setting in Vista owned and operated by a local commune. Ali Baba: Middle Eastern cuisine with huge family-style portions in Escondido. Tip Top Meat: Butchery with an onsite restaurant that is surprisingly affordable while staying high in quality and deliciousness. URBN Coal Fired Pizza: Hip eatery specializing in artisan pizza in Vista. Encinitas Sushi Lounge: Family-friendly environment with delicious sushi in east Encinitas. Green Dragon Tavern and Museum: American cuisine with a historical twist as its adjacent to a museum focusing on colonial America. Juanita’s Taco Shop: Authentic Mexican cuisine and delicious carne asada in a no-frills location in Encinitas. Bellows Restaurant: Modern gastropub in San Marcos. Other good restaurants in North County include Solace and the Moonlight Lounge in Encinitas, uber high-end Mille Fleurs in the ritzy Rancho Santa Fe community just east of Del Mar, the Land and Water Company in Carlsbad, and Pipes in Cardiff for breakfast burritos. The local Cohn Restaurant Group also has a lot of North County Restaurants, such as 333 Pacific serving up seafood in Oceanside and the unique Vintana Wine + Dine located above a Lexus dealership in Escondido. Carlsbad Premium Outlets mall is also home to a number of eateries. From food to family-friendly fun and gorgeous beaches and scenery, there are lots of things to do in North County San Diego. Keep it in mind for your next trip to San Diego and get off the beaten tourist path of the city.